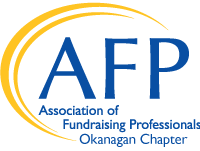 The Association of Fundraising Professionals (AFP), Okanagan Chapter is pleased to present the 4th annual National Philanthropy Day® event in Kelowna. NPD is a celebration of philanthropy—giving, volunteering and charitable engagement—that highlights the accomplishments, large and small, that philanthropy—and all those involved in the philanthropic process—makes to our community and our world. Join us along with presenting sponsor Central Okanagan Foundation.